The LifeProducts™ Commercial R.O. System - 20" x 2.5" Sediment Filter. 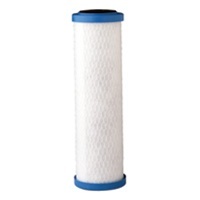 The unique technology employed in the construction of the Sediment Filter enables the filter to hold five times the sediment of any other filter with minimal pressure drop. Think about it..... That's five times fewer filter changes, five times fewer service trips and five times less volume of old filters disposed of in your local landfill. With older filter technology, sediment filters were incapable of blocking all fine sediments that could foul the down-stream carbon block filter. 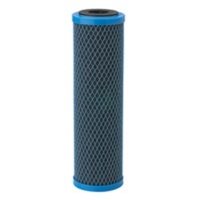 A fouled carbon block filter cannot trap chlorine, VOC's, solvents, humic, fulvic acids and other contaminants that cause odor and reduce expensive RO membrane life span and performance. The LifeProducts™Sediment Filter stops "pass-through" sediment, which increases the life of the carbon block filter by at least two times.